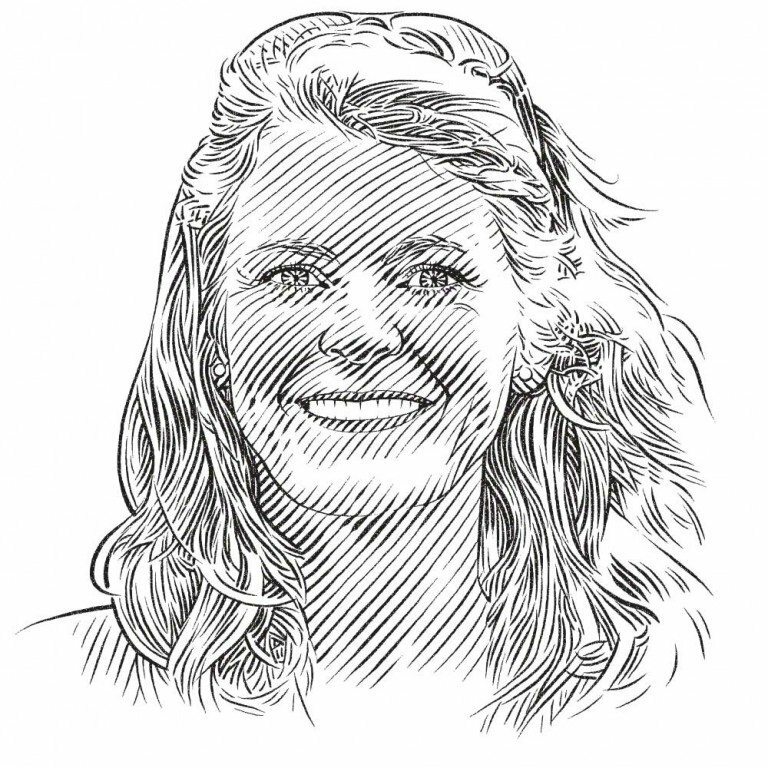 Having attended the 17th Conference of Parties (CoP17) of CITES as a technical adviser to some of the countries proposing listings for sharks and rays, Sarah Fowler reports on outstanding successes for some sharks and rays. CoP17 broke several records for shark and ray conservation and management. The first, achieved long before delegates even met in Johannesburg, was the exceptionally large number of CITES Parties that co-sponsored each of the proposals for listing silky and thresher sharks and mobula rays in Appendix II. Supporters included close to half of all countries where these species occur (including some of the world’s largest shark-fishing nations), the 28 EU member states and many small island developing states, whose waters include a substantial area of the world’s oceans. The second record was the landslide vote in favour of these proposals following the debate on them. The first shark vote was particularly striking because the silky shark is one of the world’s most heavily fished and commercially important sharks, even though catches have fallen steeply in recent years. The second shark vote concerned all three species of thresher shark. They belong to a family identified as one of the most seriously threatened in the world and are traded for their meat as well as fins. Both proposals were passed with 79% of the vote (a huge margin above the two-thirds majority needed). Finally, the whole family (nine species) of devil rays was added to Appendix II, joining the closely related manta rays listed at the previous CoP, with 85% of the votes cast. 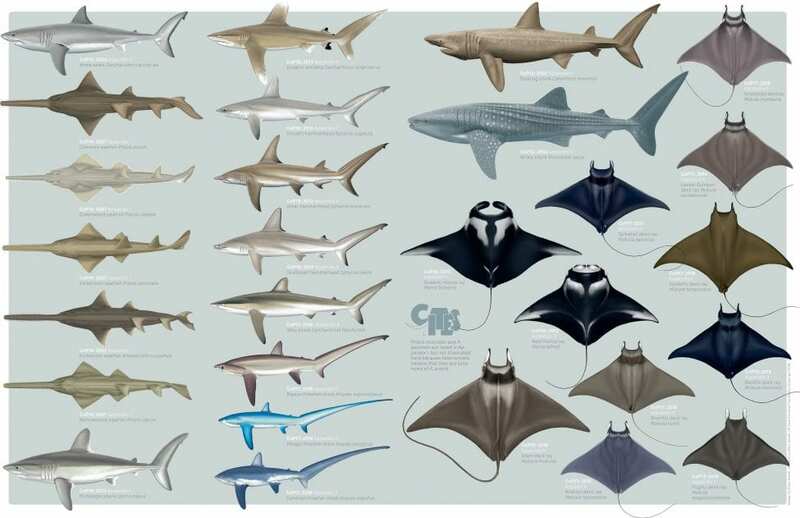 This brings the total number of sharks and rays listed in the CITES Appendices to 30 (sharp-eyed readers will notice that there are only 28 species illustrated on pages 82–83. That’s because a taxonomic reclassification of sawfishes has recently reduced their number from seven to five). The vote counts were so overwhelmingly in favour of these listings that no attempt was made to reopen the debate on the sharks and rays with a view to overturning the results in the final Plenary. This probably contributed to a third record: CoP17 finished its business and closed one day earlier than scheduled – certainly a first for me. This formerly very common pelagic shark, named for its sleek skin, has been caught in huge numbers by oceanic long-line and tuna purse-seine fisheries. During the 1980s, the fins of silky sharks made up at least 3.5% of the global shark-fin trade, a figure that rose to 4.4% in the 1990s. Today they are the second-most abundant fins (after those of the blue shark) in Hong Kong markets. Yet estimated numbers of silky sharks caught for the fin trade (500,000 to 1.5 million annually) pale into insignificance beside estimates of millions of juveniles ghost-fished and killed in the entangling nets that hang beneath many artificial fish aggregating devices (FADs). These FADs are used to attract shoals of tuna and make it easier for purse-seiners to catch the fish, but they are lethal to silky sharks. It’s no wonder that silky shark populations are declining. The association between silky sharks and tuna lay behind the decision of the government of the Republic of the Maldives to propose the silky shark for listing in CITES Appendix II. Tourism and fishing are the two most important economic activities in this island nation and healthy shark populations contribute to both. That’s why, in 2010, the Maldives declared its entire Economic Exclusion Zone a shark sanctuary and prohibited all trade in shark products. It’s well known that many tourists visit the Maldives to see reef and whale sharks, but not many people realise that pole-and-line tuna fishermen believe that healthy populations of silky sharks are essential to make tuna form shoals, in which they are easier to catch. Unfortunately, a sanctuary is of limited use when sharks swim outside it and are caught in unsustainable fisheries in adjacent waters. Maldivian tuna fishermen say that silky shark numbers have fallen by 90% in the past two decades. Concern over the vulnerability of the silky shark to oceanic fisheries and its declining stocks has already caused the regional tuna fisheries management bodies in the Western Central Pacific and Atlantic oceans to prohibit the retention and landing of the species. However, these prohibitions are very poorly monitored and enforced. It will be very difficult to tell whether these measures are leading to a recovery in silky shark populations when no one is watching! An alternative is to regulate silky shark fisheries, allowing a limited catch that supports livelihoods and also helps with the collection of scientific data and other information that can be used to monitor the health of the stocks. This is the approach promoted by Sri Lanka, the country that has reported 46% of the world’s silky shark landings during the past decade. Sri Lanka was a very strong supporter of the Maldives’ proposal to list the silky shark in Appendix II because it recognises the importance of the tools that CITES provides to ensure the sustainability of international trade and of the fisheries that supply it. It is also only too well aware of the need to use an international agreement to regulate international fisheries. Thresher sharks – common, pelagic and bigeye – have become known as ‘Indiana Jones sharks’ by the media because of their long, whip-like tails, which they use to stun small fishes. They also have the unfortunate distinction of belonging to one of the most threatened shark families – all three thresher species have undergone serious population declines. Threshers are fished for their meat and their fins. In the early 2000s, they comprised about 2.3% of shark fins identified in Hong Kong markets, representing some 350,000 to 3.9 million sharks per annum. A recent study of the fin trade, albeit using different methods, found that only 0.1% of fins sampled in 2014 were from thresher sharks. The meat, particularly that of the common thresher shark, is also highly valued, and threshers are popular game fishes for sea anglers. On the other hand, the value of thresher sharks for non-consumptive dive tourism can be huge. The community of Malapascua Island in the Philippines made a desperate plea to Parties in Johannesburg, begging them to list threshers in CITES because this would help them protect their single greatest asset: the pelagic threshers that visit a local fish cleaning station, which is now one of the world’s most famous shark dives. These sharks, through the support of visiting divers, enabled the island to rebuild its economy after the devastation of Typhoon Haiyan. This community must now be one of the world’s most fervent advocates for thresher shark conservation. The bigeye thresher was proposed for listing in Appendix II by Sri Lanka, supported by a record-breaking 50 other CITES Parties. The proposal was developed because the species is widely recognised as being so vulnerable biologically, and so susceptible to capture in pelagic fisheries, that it is now a prohibited species in the Mediterranean Sea and the Atlantic and Indian oceans. Sri Lanka has also enacted domestic legislation to protect the species, which can no longer be landed by Sri Lankan fishers. Regional fisheries prohibitions are very difficult to enforce without complementary trade controls to ensure that products entering trade were legally obtained and from sustainable fisheries. Because the fins of all three threshers are very similar, the other two species (common and pelagic threshers) also had to be listed in CITES Appendix II under ‘lookalike’ provisions so that trade in the bigeye can be regulated. The Convention on International Trade in Endangered Species of Wild Fauna and Flora, known as CITES, was established in the 1970s to prevent international trade from contributing to the extinction of exploited plant and animal species. It is the only multilateral environmental agreement (MEA) whose measures can be legally enforced, for example by setting quotas for exports of products from listed species. It is also one of the largest MEAs, with 183 of the world’s 193 United Nations member states signed up. CITES is often associated with elephant ivory and rhino horn; the African elephant and rhinos were among more than 1,000 species of plants and animals listed by consensus in the original Appendices. Today, however, the three Appendices to the Convention list about 30,000 plant species (about half of which are orchids) and some 5,600 animal species, ranging from whales and gorillas to insects and snails. Appendix I lists fewer than 1,000 species that are threatened with extinction. Trade in specimens of these species is permitted only in exceptional circumstances. Appendix II lists almost 35,000 species. They are not necessarily threatened with extinction, but trade in them must be controlled in order to avoid utilisation incompatible with their survival. The Appendix ensures that trade is legal and sustainable. Appendix III contains about 150 species that are protected in at least one country that has asked other CITES Parties for assistance in controlling trade. The triennial meetings of the Conference of Parties (CoP) are where CITES Parties review progress and make decisions on international wildlife trade matters, including the addition of new species to Appendix I and Appendix II. CoP17, held in Johannesburg, South Africa, in September and October 2016, was the largest ever convened. The nine species of mobula rays received a public relations makeover in Johannesburg when the description ‘mini mantas’ was chosen to replace the less cuddly ‘devil rays’. In 2013 at CoP16 in Bangkok, their larger relatives, the huge, plankton-feeding manta rays, had been listed on Appendix II because they were being fished unsustainably for their gill plates, which are used in traditional Asian medicine. It soon became clear that mobula rays were under similar pressure for exactly the same reason and that some populations had declined very rapidly in the past few years. While the mantas have been a particular focus of the Save Our Seas Foundation (SOSF) for many years, more recently our efforts have shifted to the devil rays in recognition of the serious problems that they also face. The SOSF has funded research into life histories, genetic studies and fisheries and markets, as well as the preparation of visual identification guides for all species and for their gill plates. The identification guides were particularly important in supporting the efforts of the Manta Trust to secure the CITES listing because they demonstrated that it is easy to train customs officers to identify manta and devil ray gill plates, if not to distinguish between all nine mobula species. Fiji had successfully proposed the mobulas for listing in the Appendices of the Convention on the Conservation of Migratory Species in 2014. Now, two years later, it spearheaded the successful proposal to add two of the largest species, for which declines had been reported, to Appendix II of CITES. All the smaller species were included in the proposal for ‘lookalike’ reasons. This proposal was passed with an astonishing 80% of the vote – only 20 Parties voted to reject the listing. The overwhelming vote in favour of the shark and ray proposals confirmed that CITES is indeed ready to contribute to the sustainability of important commercial fisheries that supply the shark-fin trade. So what happens next? The two shark proposals were adopted with a 12-month delayed implementation period and the ray proposals with a six-month delay (the listings would otherwise have come into force three months after the CoP). This gives countries extra time to work out how to implement them, for example by ensuring that the species and their products can be identified by national fisheries and customs staff and that sustainable levels of capture have been defined. Appendix II requires that trade be legal and sustainable. Countries where the sharks and rays are fished must first issue a Legal Acquisition Finding. This confirms that the products being traded did not, for example, come from protected species or protected areas, or from prohibited fishing gears, or in contravention of other laws. Once that’s done, a Non-Detriment Finding (NDF) must be issued to confirm that the export will not be detrimental to the wild populations. This is a form of sustainability certificate. For transboundary stocks, it makes sense to develop shared or regional NDFs. These might set out what needs to be done to make the fishery sustainable and/or set a Total Allowable Catch for the whole stock and split this up into quotas for each country. The shark listing proposals were helped through the debate at CoP17 by the fact that Germany had already commissioned and circulated draft regional NDFs for thresher sharks in the North Atlantic and for silky sharks in the Indian Ocean. These drafts are intended to be developed further by fishing countries, to agree conservation and sustainability actions in each region and to decide what levels of fishing and trade are safe for species listed in Appendix II. This is just the beginning of an extensive programme of work that needs to be undertaken over the next three years to implement the shark and ray listings adopted last month, as well as those from CoP16 in Bangkok in 2013. There will be close scrutiny of implementation efforts over the next few years, when countries report back to CoP18 in Colombo, Sri Lanka. The largest ever CITES CoP. More than 3,500 people from 158 nations attended, including 152 governments and thousands of observers from UN bodies, non-governmental organisations and the media. More than 200 documents were considered, including 62 species listing proposals submitted by 64 countries. The highest number of side events at any CoP were held, including several on the conservation and management of marine species. The international wildlife trade is estimated to be worth billions of dollars a year. It includes hundreds of millions of plant and animal specimens, from live animals to food, medicines, tourist souvenirs, fish and timber products. Only a small proportion of this trade comes from threatened species. These colourful living fossils, distant relatives of squid and octopus, have hovered along the deep slopes of Asia–Pacific reefs and islands for many millions of years. They take 10–17 years to reach maturity and lay only one egg at a time, which incubates for up to a year – in other words, populations increase very slowly indeed. Many populations are isolated by deep water, which nautilus cannot cross. Local fisheries that trap nautilus for their shells and meat have caused huge population declines. The shells enter trade in huge numbers. The listing proposal easily obtained the necessary two-thirds majority to approve adding nautilus to Appendix II. No, not marine animals, but very cute and among the species that most urgently required CITES attention. All eight species of Asian and African pangolins were already listed in Appendix II, but were under serious threat because of huge illegal trade in their scales, which are used in traditional Asian medicine. There was virtually unanimous agreement at CoP17 that these species, which are the world’s most heavily trafficked mammals, should be transferred from Appendix II to the protection of Appendix I. A black rhinoceros in Solio Rhino Sanctuary bookended by two plains zebras. Year after year, elephants (ivory) and rhinos (horn) dominate discussions at CITES meetings. This year was no different, but why mention this in an article that focuses on marine species? The reason is that there are important parallels between these large mammals, listed in the CITES Appendices during the first meeting in 1976, and sharks and rays, which have been such a struggle to add in recent years. All these species are being killed at unsustainable rates in substantial parts of their range, depleting many wild populations. They are being overexploited primarily to provide high-value luxury goods that are traded internationally, particularly to meet consumer demand in East Asia. In all cases, it is therefore necessary not only to control the supply end of the chain (poaching and fisheries), but also to reduce consumer demand. While these species can be even more valuable alive than dead for the relatively few communities able to engage in ecotourism, not all communities have this opportunity. An additional problem is that some of these animals are potentially dangerous alive, at least in some situations, and undeniably very valuable when dead if their products enter trade (legal or illegal). So there is a cautionary tale here: it has definitely not been easy to implement CITES listings for charismatic species like elephants and rhinos, which confront many of the same problems faced by sharks and rays. We should not automatically assume that progress will be any smoother for sharks and rays. However, the management of marine species through CITES will benefit significantly from the long history of various countries’ experience of managing their elephants, rhinos, sturgeons and even commercial timber species. Sharks and rays have another important factor in their favour: the combination of fisheries management at national and regional levels, with newly available CITES trade controls, may yield benefits not available to many large grey land animals.